Lot 2, Jalan Kemajuan Satu 16/17A, Seksyen 16, 40000 Shah Alam, Selangor, Malaysia. 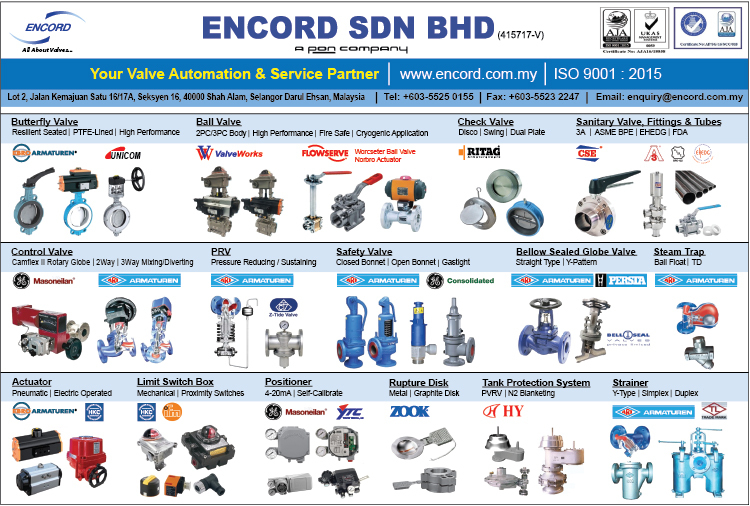 Encord Sdn Bhd is a locally incorporated company established in September 1997 with the objective to participate in the engineering supply business for all sector and industries. The Company has been expanding steadily in the industries, with the acquisition of several established product agencies. We are making "READY TO SERVE" our special undertaking coupled with understanding of the nature these industries operate. Our established customers include Oil and Gas, Petro-Chemical Plants, Shipyards, Process and General Industries. With the growth of Malaysian economy centred on the Rubber and Palm oil sector as well as the country's industrial drive gaining momentum, it is our ultimate intent to diversify into other areas to include engineering works and manufacturing. Key factors to this business opportunity and growth of ENCORD are the investment in people and skills. We shall make this our priority as qualified personnel with total commitment and excellence in all aspects of the business is and will be the driving force and pride of ENCORD.